The Contractor who claimed for unpaid in whole/ part, to serve the Employer, a payment claim pursuant to section 5 of CIPAA. The Claim must include information prescribed in section 5(2) CIPAA. This notice of claim must be validly served. Not to respond to the payment claim. Section 6(4) CIPAA, state a non-responding party to a payment claim is deemed to have disputed the entire payment claim. 10 working days from the date of receipt of the payment claim. Expiry of the 10 working days from the date of receipt of the payment claim. Parties may attempt to agree on an adjudicator, failing which, either party or both parties may request the Director of AIAC to appoint an adjudicator. The Director of AIAC to make the appointment within five working days of receipt of the request. The adjudicator appointed may propose and negotiate his terms of appointment. The adjudicator is not obliged to accept the appointment. 5 working days of receipt of the request. If the adjudicator and the parties cannot reach an agreement, or the adjudicator rejects or fails to accept the appointment, then the parties may proceed to appoint another adjudicator. (d) there are no circumstances likely to give rise to justifiable doubts. A copy of the adjudicator terms of appointment and fees is send to the Director of AIAC within seven days of his acceptance of the appointment. 10 working days from the date he was notified of his appointment. The adjudicator is to issue a direction to order the parties to deposit with the Director of KLRCA, the mandatory deposits. ​14 days after acceptance of his appointment. complete with any supporting documents. ​The respondent is required to serve an adjudication response on the claimant and the adjudicator within ten working days of receipt of the adjudication claim. The adjudication response is to answer the adjudication claim and be accompanied by any supporting documents. 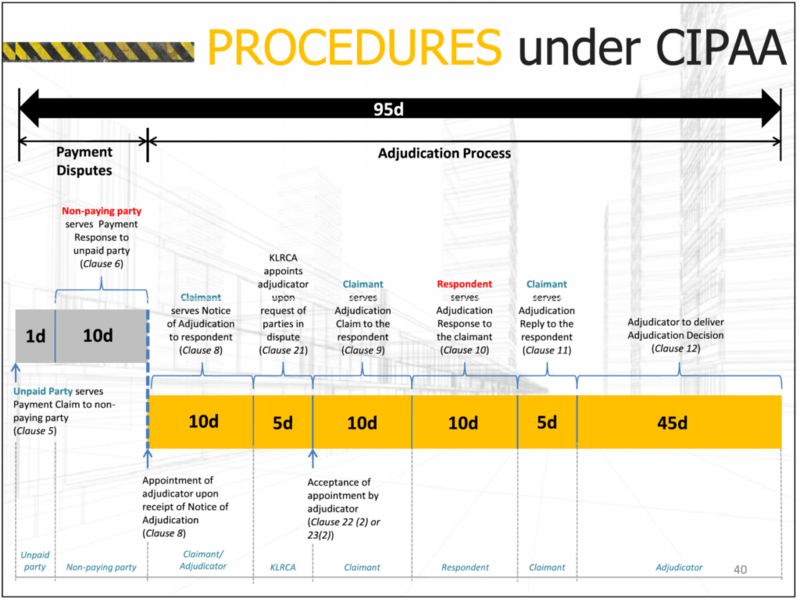 ​10 working days of receipt of the adjudication claim. The claimant may reply to the adjudication response within five working days from the date of receipt of the adjudication response. The claimant may provide further documents in support of the contentions set out in the adjudication reply. ​5 working days from the date of receipt of the adjudication response. ​Unless the parties agree to an EOT, the adjudicator must make and deliver his decision within 45 working days from the date of service of the adjudication response or the adjudication reply, whichever is later, or the expiry of the prescribed period for the service of adjudication response, if no adjudication response is received. If the adjudicator delivers his decision outside the 45 working day period, the adjudication decision is null and void. However, the adjudicator may withhold releasing his decision until the full amount of his fees and expenses have been deposited by the parties with the Director of the AIAC. the time and manner of payment. ​45 working days from the date of service of the adjudication response or the adjudication reply. A copy of the adjudication decision is to be served on each party and the Director of AIAC. The adjudicator's fees are to be released to him upon the receipt by the Director of AIAC of a copy of the adjudication decision and written confirmation by the adjudicator that he has complied with the time period prescribed by section 12(2) of the CIPAA for the delivery of adjudication decision.